Torrent: You create a torrent of the file you want to share and upload it to torrent site. I have shared a tutorial for the same here. File-sharing sites: You upload the file on a free file sharing sites such as Dropbox, file factory and others can download file from there. Today I will be telling you another way which will make the file sharing easier for you. You can use this technique to share file in your local network (LAN) or even on WAN if your system is accessible via direct I.P. This software is known as HFS and is available for Windows. 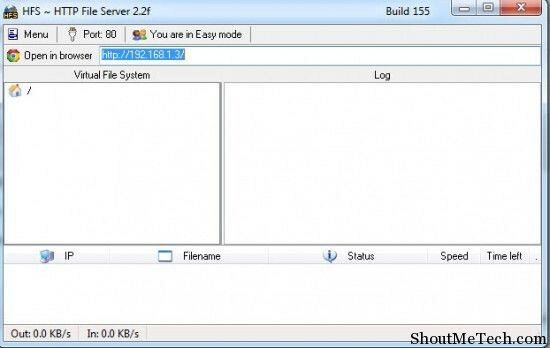 Using HFS (HTTP file server), you can create an HTTP server on your system with just one click. You can simply add any file which you want to share by dragging and dropping it or by adding it via menu. Now, all you need to do is give your I.P to your friend with whom you wish to share the file. If you have password protected the file, you can share the access name and password. Sound Techy, well you don’t have to worry about it, If you simply want to share a file, Add folder and Give your I.P to your friend. You are done. You can also check if your server is running or not by going to http://localhost in your browser. If you see a screen like above screenshot, that means you have successfully created you free HTTP server. This is a free software and you can use it for various purpose. For example, you can use to create a local file sharing location for your office or for your team. If you are in college LAN, you can use to share files (Movies, music, documents) with others. Overall, this is an ultimate piece of software for Windows, which you will love. Do let us know if you have ever used HFS or any other similar software to create HTTP home server at your home computer?